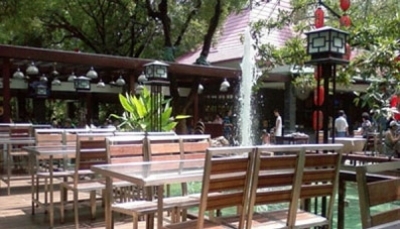 Liuhua Congee House in Liuhua park is one of the more central and lovely outdoor eateries. Add to that spacious as well. Liuhua's expansive corridor and outdoor section include two fish ponds, a multitude of plants and a view of the beautiful surrounding park environment. Liuhua is most known for its dim sum and congee, but also impresses visitors with its sashimi, grilled items and Cantonese food. Expect variety here, especially in their dim sum and congee. Most plates are between 25 and 80 RMB, but their sashimi starts at 60. Best time to get a seat: Monday to Friday before 6 pm for dinner. On weekends and holidays, before 11:30 am for lunch and before 5:30 pm for dinner. Does the outdoor section close? : It is closed when it is raining. Getting there: Take bus 181, 186, 31, 251, 260, 33, 38, 518 or 823 and get off at Liuhua Gongyuan bus stop. The sign by the gate should show you how to walk to the restaurant, which is about five minutes away.